Cakes do not always have to be iced sponge layers. Preparation takes about 30 minutes. Cooking takes about 30-40 minutes. 1. Sift the flour with the salt and sugar into a large bowl. Add the baking powder, if using, with the flour. Rub in the butter or margarine until the mixture resembles fine breadcrumbs. 2. Make a well in the center and place in the egg yolks or the whole egg. Add the vanilla or lemon rind and 1 toss milk or water. Mix into the flour with a fork. If the pastry appears too dry, add the additional milk or water. 3. Knead together quickly with the hand to smooth out. If the mixture is too soft, wrap well and chill briefly. 4. Press the pastry on the base and up the sides of a flan dish, preferably one with a removable base. Chill 15 minutes. 5. Meanwhile, prepare the fruit. Peel, core and quarter the pears lengthways and apples slice thinly. Cut the plums in half and remove the stones. Slice thinly. 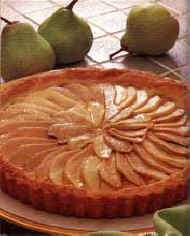 Arrange the chosen fruit on the base of the flan in straight lines or circles with the slices slightly overlapping. Sprinkle on sugar and bake in a pre-heated oven at 200c for 35-40 minutes or until the pastry is pale golden brown and the fruit is soft. Allow cooling and sprinkling with additional sugar before serving. 6. Serve with whipped cream or ice cream.